In this paper we examine the sustainability of public debt in case of India. We have used combined government data (Centre’s and State’s government) for a period from 1990 to 2016). For testing the sustainability of debt, we have taken government revenues and expenditure. First we have investigated co-integration between government spending and revenues using ARDL bound testing model. The bound test reveals that there exists no long-run relationship between the variables. Gregory-Hansen and Hatemi-j threshold co-integration test are applied to test the sustainability hypothesis in the presence of regime shift. the result shows that no co-integration relationship between the variables in case of single structural break, but for two structural break our study confirm existence of co-integration relationship for the given variables. We do not find the long-run coefficients statistically significant for sustainability of public debt. Governments take public borrowing to meet the gap between their revenues and expenditures. Mostly domestic borrowings are preferred, as it bears fewer burdens than that of external borrowings. If their domestic markets for borrowings are not well developed they move to external borrowings. The continuous rise in government expenditures create high fiscal deficit, which pushes the government to borrow resources from both external and internal sources. Recently the sustainability of debt has been given considerable attention. Fiscal sustainability concern is spread for both the developed and developing nation. For an instance , the preconditions to enter the European monetary union is Maastricht treaty required from a government not to run budget deficit and debt- GDP ratio beyond a point of 3% and 60% of GDP respectively. Indian government tried many times to reduce fiscal deficit, but sustaining a lower fiscal deficit still a challenge for India, mainly due to high unproductive expenditures. In the case of India, fiscal sustainability got the importance during late 1980s with sharp fiscal deterioration; combined government (centre and state) debt was 52.4% of GDP in 1980-1981. India’s government debt grew firstly in 1991-92, when it was 80.1% of GDP and then again 1997-98, when fiscal deficit became 10 percent of GDP . The public debt scenario of India was not healthy during post economic period, it is worse than in pre-reform period. 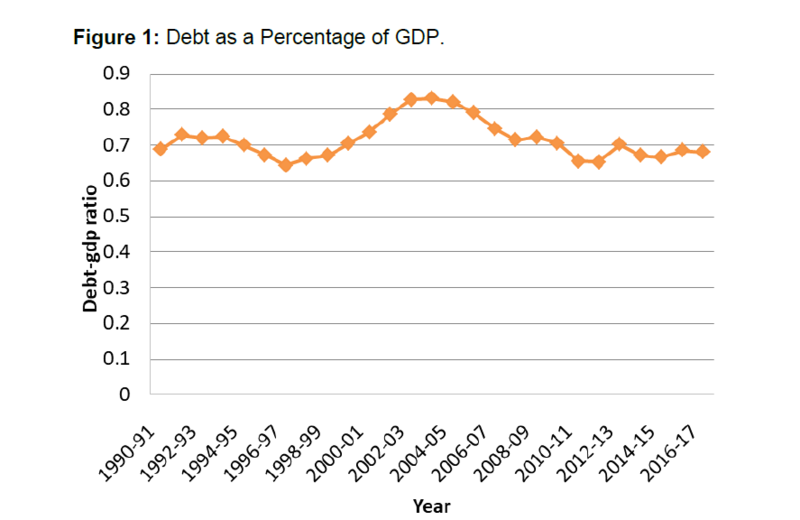 During post-reform period combined centre and state government’s average debt was 79% of GDP . More concern about the sustainability of debt was raised by 12th finance commission in 2004 due to increment in debt more than GDP from 1996 to 2003. Since, 2004 the intensity of concern was reduced due to favorable foreign exchange reserves of around 300 billion US dollar in 2009-10, and economic growth increase by 7.5% per annum from the period of 2004 to 2008. Hence it helped in reducing the fiscal deficit below 4% of GDP by 2007-08. But again fiscal deficit of government of India jumped to over 8% of GDP as expansionary fiscal policy was taken to protect the economy from global financial crisis which further have the concern about fiscal policy sustainability of India. The amount of public debt in India is so high that burden on each Indian multiplied by 14 times since 1990-1991 to 2104-2015. The growing rate of per capita debt is faster than per capita income. On the basis of data taken by the Ministry of finance, the per capita debt increased at 23% per annum, while per capita income increased at 14% per annum during 2102-13 to 2014-15. Why is fiscal sustainability or debt sustainability required? Debt sustainability implies that current fiscal policy can be continued. If debt is not sustained, then government’s policy is necessary. The failure of debt sustainability is a sign of problem for government in long-run to pay its debt. High debt will be paid in the form of high interest rates, which hinders economic growth. Many attempts have been taken to manage debt in India, like MTFRPs (Medium Term Fiscal Reform Programs) in 2000-01 and FRBM (Fiscal Responsibility and Budget Management Act) in 2003 but still debt is not controlled. Recently serious concern has been expressed about the sustainability of India’s public debt. In this paper we examine the sustainability of India’s public debt. We have taken combined debt of centre and state governments in the study and period of study is from 1991 to 2016. The rest of the paper is designed as follows: Section 2 discusses about earlier literature available on the present study. Section 3 provides a brief report about India’s trend of debt/GDP, Expenditures/GDP and Revenues/GDP. Section 4 provides analytical framework. Section 5 discusses data, estimating models and methodology. Section 6 deals with data analysis and empirical results. Conclusions and policy implications are given in section 7. Traditionally fiscal sustainability was measured in terms of debt-GDP ratio and policy is considered sustainable, if debt-GDP ratio does not grow over time. There are alternative approaches also to test the sustainability of public debt. In Domar approach rate of growth of GDP must exceed the growth of interest rates. Measuring the sustainability of debt from Domar condition is not reasonable . In order to get reasonable result, the standard approach in the literature being used is Intertemporal Budget Constraint (IBC). In econometrics debt sustainability is tested by the co-movement between government revenues and expenditures. Non-existence of co-integration between revenues and expenditures are interpreted as lack of sustainability. Hakkio et al. and Quintos [3,4] have investigated debt sustainability based on government’s intertemporal budget constraint, using co-integration between government revenues and expenditures. If there exist a co-integration relationship between government expenditures and revenues debt is said to be sustainable. A Strong sustainability if coefficient of co-integration is equal to one and week if it is between zero and one. Using this technique many other studies have investigated for co-integration between government revenues and expenditures to test debt sustainability. Buiter and Patel  applied intertemporal budget constraint technique showed unsustainable debt for India, Tarawalie and Oshikoya  examined that fiscal deficits was weekly sustainable for all the WAMZ (West African Monterey Zones) countries except for Sierra, Lusinyan and Thronton  reached at the conclusion that there was weak sustainability for South Africa, Jha and Sharma  revealed sustainability of public debt for India, Deyshappriya  concluded a unsustainable fiscal policy for Sri Lanka, Rajan Goya  suggested that policy of centre and state government individually is not sustainable, but weekly sustainable for combined government for India, Abdullah et al. examined that fiscal deficits are sustainable for Malaysia in long-run. Considering the previous literatures on fiscal sustainability, we reached at the conclusion that only some of the literatures available (Afonso et al. , Haider Mahmood et al. , Kustepeli et al. , Tanner et al. ) used structural break test applying co-integration test for government revenues and expenditures. The studies without considering structural break test likely to be inappropriate result. Our intend in this study is to overcome the weakness by using co-integration tests for single structural break and two structural breaks given by GH (Gregory & Hansen) and Hatemi-j (HJ) respectively. The aim of the study is to test the following major objectives. • To test the public debt sustainability for India. • To examine the long-run relationship between government revenue and expenditure as well as strength of relationship. Mainly the evaluation of debt in India started from 1951.There is four distinct phases of debt up to now. Period from 1968 to 1974 and 2005 to 2016 showing downward trend, while the period from 1952 to 1968 and 1974 to 2004 showed upward trend in debt/GDP ratio. Figure 1 shows the trend of debt as a percentage of GDP from 1990-91 to 2016- 17and Figure 2 showing trend of government’s revenues and expenditures. Figure 2 reveals that expenditures are continuously greater than receipts. Figure 1: Debt as a Percentage of GDP. Figure 2: Movement of Revenues and Expenditures. The concept of sustainability of debt implies the fulfillment of intertemporal budget constraint condition. It means in the long-run the market value of government debt must be equal to present value of debt. In the violation of above condition fiscal policy is not sustainable. Budget constraint in the equation form may be written as below. Where gt is the expenditures without interest payment, Rt is the government revenues with seignior age, it is the interest rate, bt is the level of debt. Furthermore, size of the economy is not considered in given variables in the eqn. (1). Therefore to take into consideration the economy size GDP ratio of the given variables are required. Where, Yt is nominal GDP and ρt is growth rate of nominal GDP. Ratio of the GDP is represented in the following capital letters. Where, which is growth adjusted interest rate, i* is the average of that is equivalent to . Now here if, the eqn. (1.7) can be written as given below. If, expectations condition are imposed on available information at time t. Because Bt-1 is identified at time t that is the hypothesis government follows as its budget constraint written as following. Therefore, this does not show Ponzi game rule which describes public debt to GDP ratio should not increase more rapidly than interest rate. Principal amount of debt and interest cannot be financed for an indefinite time with new debt. Moreover the amount of public debt is required to wipe out by all present and expected discounted future surpluses. The method to examine the sustainability of public debt implicates testing the long run relationship in the below given eqn. (1.11). Where Rt and Gt shows government’s revenue and expenditures including the interest payment on public debt. For the debt sustainability the co-integration relation between government revenues and expenditures is used. The coefficient of expenditures plays an important role to determine the degree of debt sustainability. If, γ=1 means strong sustainability of debt if γ is between zero to one leads to weak sustainability of debt. Eqn. (1.11) has been used as the source for checking sustainability conditions of government intertempoal budget constraint [4,16,17]. We have the time series data on combined centre and state government’s revenues and expenditures as a percentage of GDP at current price. The data on all the variables are in rupee billion and sources of data is handbook of Indian statistics. All the variables have been converted into log form. Model: The long-run relationship between total expenditures and total revenues shows public debt sustainability based on intra-temporal public budget constraint. As given in the following equation. Where, t=Time period, 1,2,3….n and ut is error term at period t, LRGt and LEGt are government’ total revenues and expenditures in log form respectively. Unit root test: In the present study, as we are using time series data, therefore it is compulsory to check the unit root, to prove whether the series are stationary or non stationary, in order to evade the spurious regression. Since here we have applied ADF-test, PP-test, and KPSS-test of unit root. In case of ADF and PP-test the null hypothesis is that variables are non-stationary and for KPSS-test the null hypothesis is that variables are stationary. Co-integration methodology: As in case of conventional tests of co-integration of Engle et al. and Johansen et al. which have been used widely in empirical research to examine the long-term relationship of variables especially in a bivariate or multivariate framework .one of the drawbacks of conventional co-integration is that, it is not used when variables are integrated at different order like I (0), and I (1). To overcome this problem, we used ARDL bounds tests approach for co-integration given by Pesaran et al. . ARDL (Autoregressive Distributed Lag Model) model can be used when variables are not integrated at same order. ARDL Model also has the advantages of simultaneous estimation of long-run and short-run parameters in a model. Checking the stationary of the variables (LRG and LEG), we found different order of integrity. LRG is stationary at first difference at 1% level of significance while LEG is stationary at level at 5% level of significance in ADF test, so we used ARDL bound approach for co-integration. Since ARDL model of co-integration also have the drawbacks, it was assumed in ARDL model that co-integration relationship does not change over the entire period of study which is not realistic when series is long. In long-run structural break is a common phenomenon, if break is found our result using ARDL model would be misleading as co-integration relationship are changed in the presence of structural break. Gregory-Hansen  and Hatemi-J  for co-integration relationship argued about the structural break test. So here in our study to avoid the misleading result, we use ARDL bound test technique followed by GH and HJ co-integration test based on single and two structural breaks respectively. In ARDL model we use the lag values of the dependent variable and the lagged and contemporaneous values of the exogenous variables. Short-run effects are directly estimated, and the long-run equilibrium relationship indirectly estimated as ARDL technique involves error correction term. The model is written as following. H0: θ1=θ2=0, against the alternative hypothesis H0: θ1=θ2≠ 0. For investigating the presence of long run relationship among variables the bound testing procedure is used in which the null hypothesis (H0) of no co-integration is tested against alternative hypothesis (H1) of the existence of co-integration. This ARDL bound test is based on Wald test (F-statistic), in which two critical values are given by Pesaran et al. . If the computed F-statistic is higher than the upper bound critical value, the null hypothesis of no co-integration is rejected. On the other hand the null hypothesis of no co-integration is not rejected, if the F-statistic is less than the lower bound critical value. If the computed F-statistic falls between the two critical bound values, then the results for co-integration are inconclusive. If the long run relationship is confirmed in the above test, then the following error correction model (ECM) is used to estimate the short run coefficients. Where, γ speed of adjustment and EC is the error correction term (Table 1). Where β0 is common intercept and β1 is the differential intercept over the common intercept in eqn. (6), but differential intercept over the common intercept for the first sub sample of structural break in eqn. (7). The differential intercept β2 over the common intercept β0 is second structural break in eqn. (7). D1t is dummy variable for the endogenous structural break at time t=1,2,….n for eqn. (6), but for eqn. (7), dummy variable to represent the first endogenous break; D2t is the dummy variable representing the second endogenous structural break at time t=1,2,…..n for eqn. (7). The dummy variables with the known parameters T1 and T2 belonging to the 0, 1 meaning the relative timing of regime change point or structural break points which are not known a priori. The standard methods for testing the null hypothesis of no cointegration for eqns. (6) and (7), when there are no dummies for structural breaks are residual based approach of Engle et al. . GH has shown that residual based tests namely Augmented Dickey-Fuller (ADF) and, Zt test proposed by Perron  applied to regression errors to test the null hypothesis of no co-integration leads to misspecification of co-integration if the structural breaks are unknown. GH has however used an advanced nonlinear co-integration test with a structural break which is considered as multivariate extension of univariate ZA (Zivot Andrew) unit root test . Gregory et al. proposed a residual based co-integration test (GHtest) that takes into account regime shifts either in the intercept or the entire vector of coefficients. They proposed biased –corrected modified ADF*, Zα* and ZT* for testing co-integration of the above variables. The null hypothesis of no co-integration is tested first by running regression of eqns. (6) and (7) for each possible structural break τ ϵ T=(0.15, 0.85) in the case of GH test and τ1 ϵ T1=(0.15, 0.70) and τ2 ϵ T2 (0.15, 0.85) for HJ test. Then applying eqns. (8)- (10) for regression errors of each possible structural breaks. The smallest value of (8)-(10) is chosen to compare against the critical values of one –break point and twobreak point test developed by GH and HJ respectively, to accept and reject the null hypothesis of no co-integration. First of all before making the co integration test, we check the stationary of the variables or integrity of the variables .The study used ADF, PP, and KPSS test of unit root for both intercept and trend taking together. The unit root result are presented in Table 2, The variables are stationary at level in case of KPSS test but in case of PP test LRG and LEG both are stationary at first difference at 1% level of significance. ADF test shows that LRG is stationary at first difference at 1% level of significance but LEG is stationary at level at 5% level of significance. The result of Zivot-Andrews test has also been shown (Table 2). In Zivot-Andrews test two breaks found 2002-03 and 2010-11 in model C. Model C shows both intercept and tend in the series. Unit root table reveals that there is a mixtures of the order of integration for the variables consequently for co-integration relationship, we have used ARDL model (Table 3). Table 2: Zivot-Andrew Unit root test. Table 3: Stationary test result. Now after testing stationary we proceed for ARDL bound test (Table 4) for checking the long-run relationship between the variables. The test revels that the calculated F statistic is 2.553 which falls below the lower bound I (0) at 10% level of significance . Table 4: ARDL co-integration bound testing approach result. The results of threshold co-integration tests are given in Table 5 which reveals that in case of GH modified ADF*, , and test under the regime shift model fails to reject the null hypothesis of no co-integration relationship at 1% level of significance. For two structural breaks we applied HJ test found that ADF* test rejected the null hypotheses of no co-integration at 1% level of significance. Here co-integration relation is found for two structural breaks under regime shift model at 1% level of significance. The identified breaks years are, 1994-95, 2002-03 in two break models. The breaks are as a response of policy changes. FRBM (Fiscal Reform and Budget Management Act) was introduced in 2003. Table 5: Threshold co-integration test with Regime Shift. Note: *** Significant at 1% level of significance. The number in parentheses represents break points. The critical values for GH and HJ tests are available in GH (1996, pp109) and HJ (2008, pp501). After confirming the presence of co-integration in two structural break model (HJ), next step is to find out the coefficient of long-run relationship and draw the result of the degree of debt sustainability. We have calculated the coefficient of parameters for two endogenous breaks model .The result reveals in the Table 6 that the coefficient is 0.389 in double structural break model which is less than one. So here values are supporting only for weak sustainability rather than strong public debt sustainability. Table 6: Estimated parameter values with two endogenous breaks. Note: Figures in brackets are t-statistics. 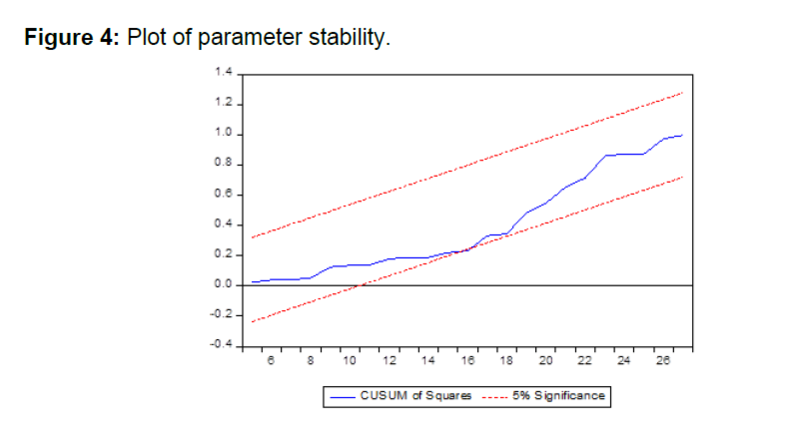 The result of CUSUM and cumulative sum of squares of recursive residuals (CUSUMQ) tests which are given in the parameter stability graph. The results reveal that our model is stable at the given level of significance (5%) (Figures 3 and 4). Figure 3: Plot of parameter stability. 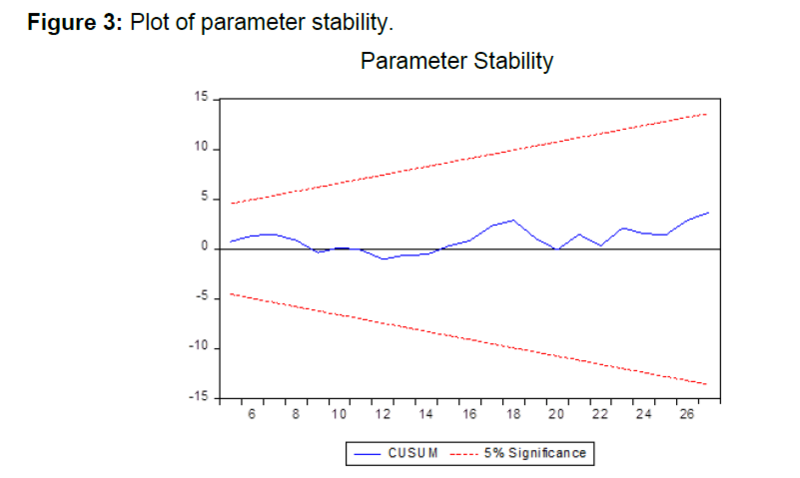 Figure 4: Plot of parameter stability. High public debt is the major problem of all the developing nations, like India at present. Increasing debt/GDP ratio curtails private investment as government pay this debt through borrowing from the market which leads to high interest rate. Hence sustainability of debt is needed for the smooth working of the economy. The present study has examined the public debt sustainability of public debt in case of India for a period of 1991 to 2016. We investigated a nexus between government revenues and expenditures for testing the sustainability of debt. The ARDL bound testing approach used to test check the variables for co-integration. Furthermore Gregory-Hansen and Hatemi-j threshold co-integration test are applied to check the co-integration relationship in the presence of unknown endogenous structural breaks. The ARDL model did not confirm any long-run relationship between the variables government revenues and expenditures. In case of threshold co-integration test only HJ test provide the result in support of co-integration relation. The endogenous structural break is found in, 1994-95, and 2002-03. However the estimated parameter or slope parameter not supporting the debt sustainability. The coefficients are insignificant in HJ (two endogenous breaks) test as the values of coefficient are less than one calculated Table 6. The country, India can get free from the burden of high debt and deficit if available recourses are used properly. Situations are dete from Bal and Rath , rioting by misuse of recourses as recourses have never been taken properly. Fiscal deficit in budget is due to high non developmental expenditures of the government, deficit can be controlled by reducing such expenditures. The author’s especially thankful to Hansen and Hatemi-J for providing the Gauss codes to test threshold co-integration. The authors are indebted to the referees for their important suggestions. Handbook of Statistics on Indian Economy (2012) Reserve Bank of India. Domar ED (1944) The" burden of the debt" and the national income. The American Economic Review pp: 798-827. Hakkio CS, Rush M (1991) Is the budget deficit “too large?”. Economic inquiry 29: 429-445. Quintos CE (1995) Sustainability of the deficit process with structural shifts. Journal of Business and Economic Statistics 13: 409-417. Buiter WH, Patel UR (1992) Debt, deficits, and inflation: an application to the public finances of India. Journal of Public Economics 47: 171-205. Oshikoya TW, Tarawalie AB (2010) Sustainability of fiscal policy: the West African monetary zone (WAMZ) experience. Journal of Monetary and Economic Integration 9: 1-29. Lusinyan L, Thornton J (2009) The sustainability of South African fiscal policy: an historical perspective. Applied Economics 41: 859-868. Jha R, Sharma A (2004) Structural Breaks, Unit Roots, and Cointegration: A further test of the sustainability of the indian fiscal deficit. Public Finance Review 32: 196-219. Deyshappriya NR (2012) Debt and fiscal sustainability in Sri Lanka. International Journal of Scientific and Research Publications 2: 1-8. Goyal R, Khundrakpam JK, Ray P (2004) Is India’s public finance unsustainable? Or, are the claims exaggerated? Journal of Policy Modeling 26: 401-420. Abdullah H, Mustafa MM, Dahalan J (2012) An empirical study on fiscal sustainability in Malaysia. International Journal of Academic Research in Business and Social Sciences 2: 72. Afonso A, Rault C (2007) Should we care for structural breaks when assessing fiscal sustainability? Economics Bulletin 3: 1-9. Mahmood H, Habib A, Rehaman JU, Zafar T (2014) Does Sustainability Hypothesis Hold In Developed Countries? A Panel Co-Integration Analysis. International Journal of Global Business 7: 57. Kuştepeli Y, Onel G (2005) Fiscal deficit sustainability with a structural break: An application to Turkey. Review of Social, Economic and Business Studies 5: 1-20. Tanner E, Liu P (1994) Is the budget deficit “too large”? : Some further evidence. Economic Inquiry 32: 511-518. Trehan B, Walsh CE (1988) Common trends, the government's budget constraint, and revenue smoothing. Journal of Economic Dynamics and Control 12: 425-444. Kalyoncu H (2005) Fiscal policy sustainability: test of intertemporal borrowing constraints. Applied Economics Letters 12: 957-962. Engle RF, Granger CW (1987) Co-integration and error correction: representation, estimation, and testing. Econometrica: Journal of the Econometric Society pp: 251-276. Johansen S, Juselius K (1990) Maximum likelihood estimation and inference on cointegration-with applications to the demand for money. Oxford Bulletin of Economics and statistics 52: 169-210. Pesaran MH, Shin Y, Smith RJ (2001) Bounds testing approaches to the analysis of level relationships. Journal of Applied Econometrics 16: 289-326. Gregory AW, Hansen BE (1996) Residual-based tests for cointegration in models with regime shifts. Journal of Econometrics 70: 99-126. Hatemi-J A (2008) Tests for cointegration with two unknown regime shifts with an application to financial market integration. Empirical Economics 35: 497-505. Perron P (1989) The great crash, the oil price shock, and the unit root hypothesis. Econometrica: Journal of the Econometric Society pp: 1361-1401. Zivot E Andrew D (1992) Further evidence on great crash, the oil price stock, and the unit root hypothesis. Journal of Business and Economic Statistics 10: 251-270. Bal DP, Rath BN (2014) Public debt and economic growth in India: A reassessment. Economic Analysis and Policy 44: 292-300.